Another year gone and what have I done? Now that Christmas is out the way and another year is almost over, I thought I would take some time to reflect on what I have done over the past 12 months. When I think about it, it has been quite a big year for me as an author. I feel like I have worked hard and have seen progress and I’m confident that I’m on the way to achieving my dreams. I’ve created a marketing plan for a series of short stories and a fantasy trilogy. I found out that the way I had previously learnt to format my manuscripts in word for converting to e-book was not the best way to do so. I have updated my publications page on this blog site. I have also managed to obtain a few reviews for my short stories (thankfully all positive so far), which is amazing as these reviews really make a difference to the discoverability of an author (so another massive thank you to those that have left a review, either on Goodreads, Amazon or anywhere else). Wow! what a year it has been. I would like to say a big ‘thank you’ to you, my readers, who have made it all worth while. I hope next year is just as productive for me and that you’ll continue to support me by following my blog, reading my books and leaving reviews. I wish you all the best for a fantastic New Year! Happy Festive Season! In the spirit of Christmas, I have a give-away offer for you. That’s right, you can get a FREE copy of the new anthology ‘Darkest Depths’ containing my story ‘Darkness In Shadows’ (you can also get ‘Low Life’, another of my stories, FREE in the anthology ’18’ if you sign up to my mailing list). Darkness in Shadows is a short horror story about a top secret machine that has a dark effect when it’s turned on. The anthology ‘Darkest Depths’ is packed full of short stories by up and coming Australian authors. You can get your FREE copy of Darkest Depths from Amazon between the 25/12/16 to 28/12/16 (Please note, this give-away runs under Amazon’s U.S. time Zone). Feeling a little jaded as the end of the year approaches? Sitting down at your keyboard, only to find your writing flow has turned into a struggle akin to dragging yourself across shag carpet wearing a corduroy suit? As a writer, there is a temptation to limit your work to things you’re familiar with; after all, we’re often told: write what you know. But stepping outside your comfort zone can be a great way to revitalise your writing practice and stretch your writing muscles. Who knows? You might discover something new about yourself and give your brain the kickstart it needs. 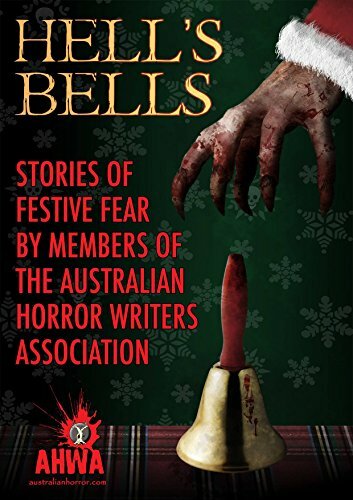 The Australian Horror Writers Association recently put out a call for flash fiction for their forthcoming anthology, Hell’s Bells. The requirements were simple enough: a 500 word Christmas ghost story with a submission period of a mere sixteen days. I’d written short fiction before, but never anything that short. Submitting to the AHWA has always been one of my goals, so I thought, why not? Imagine my surprise when the characters muscled past me onto the page, demanding to tell their story. In 500 words and two days’ writing, I had a lovely little tale of horror, pitting a malicious grandmother against a formidable Santa Claus. To my delight, Grandmother Rina was accepted and features alongside a list of work by authors that reads like a who’s who of Australian horror; and I’m reminded once again what a vibrant writing community we have. Just what I needed to carry me through to the end of the year and onwards to 2017. So, take a chance. Try something new. You never know what could happen. How do you kickstart your writing practice? They’re back! Now how do I chop and change them? Alright… It’s happened! I got all 4 of my stories back from my editor last week. 2 Short stories, a novella and my novel. Now the pain begins. This is the part where I have to decide what changes to accept and what to decline. What suggestions to take on board and use to rework my story and make it better. What suggestions to omit because they don’t align with my style and the way I want my story to unfold. If you think getting someone to do your editing will fix all your problems, think again. Yes, the copy edits are easy. They are mostly simple grammar corrections, word changes, etc… and you accept or decline them and move on. But the structural edit is a different beast altogether. While an editor can give you a structural report detailing what they think you need to do to improve your story, they are not there to do the work for you. They are there to guide you with your writing. You still need to consider the advice given and rewrite where required. And I have a lot to consider, so I guess I had better make a start on it. To my readers that are waiting on the next story to be released, I apologize. I had hoped to have at least 1 out before Christmas, but it’s looking like it won’t happen until the New Year now. The good news is that I have 4 stories that are nearly ready. So keep your eyes open for my new releases coming soon, or sign up to my mailing list and I will let you know when they are released. Until then, I hope Santa brings you a great book. Happy reading.